Chances are you don't come across too may lightning bugs during the daylight hours. That's because they're low to the ground, resting up for their evening activities. Lightning bugs have a short life span, of about two months, so they have a lot to keep them busy during the night hours. Fireflies live in warm and temperate regions, preferring humid areas because they thrive in moist conditions. That's not to say they shun dry climates,but if there's a consistently damp spot available, they'll happily settle in the area. These aren't city beetles; you're likely to see lightning bugs in parks, yards, gardens, meadows and woodland edges. Fields and gardens give lightning bugs the long grass they love. During the day, when they're not so active, they'll hang out on the ground. Tall grass provides cover during the daylight hours, as well as a good vantage point for sending and receiving signals at night. As the sun sets, they'll make their way to the tips of grass blades, where they'll launch from to begin their night's work. Night time is time for romance in the lightning bug world. Their bioluminescence helps in that department. Each species has its own light flashing pattern, which helps them to attract mates of the same species. After mating, female lightning bugs lay about 500 eggs in the damp ground. It takes a month for the eggs to hatch. The larvae spend a year -- or sometimes two -- feeding on worms, snails and slugs before they pupate and turn into fireflies. Lightning bugs' light does more than attract mates; it warns away predators, informing them of their unappealing taste. 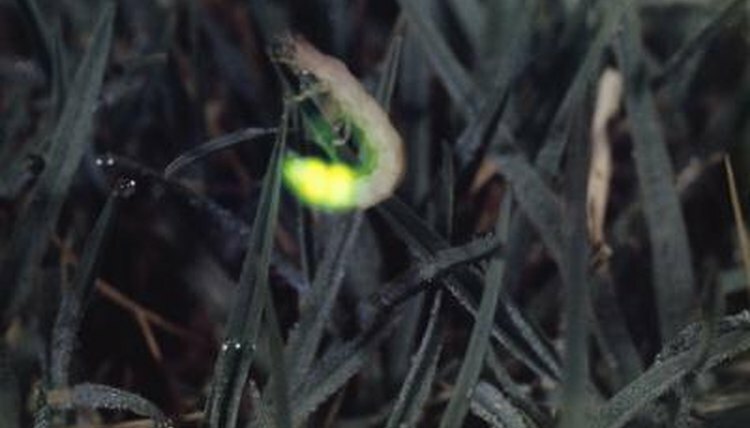 The glow works both ways: Fireflies also use their bioluminescence to attract prey, including other fireflies. Lightning bugs also will eat nectar and pollen and sometimes, they don't eat at all. If they complete their mating cycle before they get around to eating, their life's work is complete, and they've reached the end of the line. How Do Ants Know How to Find Their Way Home?